Yesterday I came across this thought provoking quote via one of my daily devotionals. As one who has a constant struggle with the spiritual nature and meaning of seeds & fruits, gates & doors and paths & roads, this simple saying struck a deep blow to my mind. I just had to create an image to go with it. “What Kesey’s quotation about apples and seeds says to us about perspective is absolutely beautiful in its simple truth: there’s no way of knowing the extent of the potential in anything, really, and something like an apple seed can give us years and years of bountiful harvests, with uncounted apples. People are the same way, of course. There’s no telling what’s inside each person that we meet, no telling the potential that each person has for growth and for doing exceptional things. 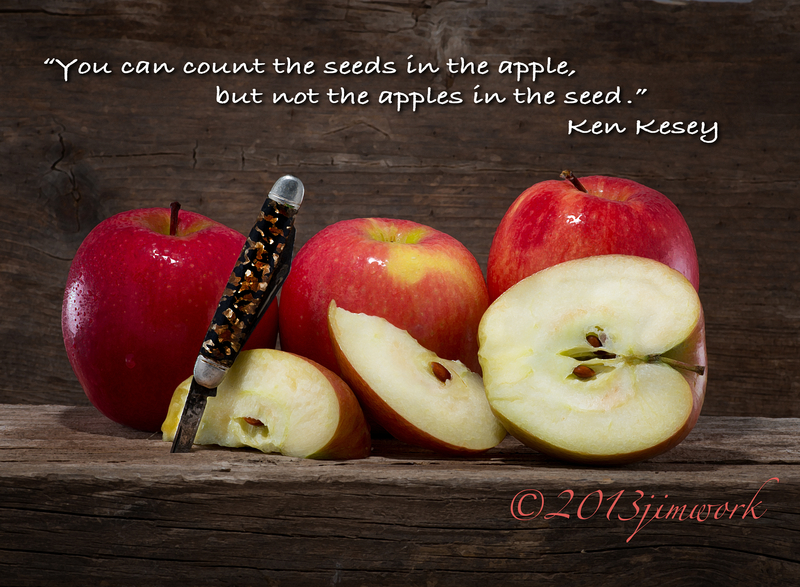 Just like the apple seed, though, our potential is realized by creating just the right conditions for our growth and development. Just as the apple cannot thrive in dry, barren climes, so is it difficult for us to thrive in situations that are not fitting.” ©Walsh, Tom: Living Life Fully’s Daily Meditations, Year One. Living Life Fully Publications. So, what is the moral of this to you ? Lovely pic, what are you going to do with it?